Ever since forming Clinard Dance Theatre in 1999, Wendy Clinard has been pushing flamenco in a new and fresh direction. Clinard Dance will present an afternoon of flamenco featuring the Flamenco Quartet Project at 3 p.m. Aug. 20 at the National Museum of Mexican Art, 1852 W. 19th St. Chicago. Tickets are $25 for general seating, available at www.brownpapertickets.com. I had the chance to talk to Clinard about the upcoming show. Q - Great talking to you again. So what is the concept behind the Flamenco Quartet Project and what should people expect from the show? This project is dedicated to exploring new exponents of flamenco. Led by an open minded spirit, our ensemble seeks to engage with contemporary culture through vibrant performances that honor traditional flamenco and our shared passion for music and dance discovery. 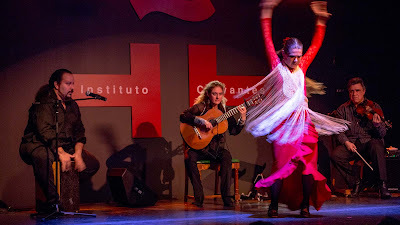 People can expect to see/hear flamenco in the traditional sense but notice unique instrumentation and world-informed influences. What is important is to note that this is not a “fusion” project; the inventions are born from a deep understanding of how traditional flamenco functions. Q - Violinist Steve Gibons, guitarist Marija Temo and percussionist Javier Saume also are part of the show. What do you think they bring to the show? Steve and Marija have composed original pieces for the Quartet. Marija has an extensive background in Classical Spanish and Steve has an extensive background in Balkan forms as well as American jazz (including his amazing improvisation sensibility). Javier draws on classical and world-form, as well. Q - You created Clinard Dance in 1999. How did you think your group has brought flamenco dancing in the spotlight? Where do you think flamenco dancing has to go from here? Our work is rooted in flamenco and understanding the unique way the guitar, song and dance interplay (otherwise known as flamenco structure). We lift this structure to play with unique instrumentation and/or devise original departures from this structure. We also extract the universal qualities –the rhythmic /percussive nature, call and response, isolations in the flamenco body so that the participants can join in with whatever the “theme or story” of a given project directs. Repurposing flamenco to find the live qualities of a particular time and place (i.e. 2017 in Chicago,) is what is fundamentally and historically “flamenco” and it holds the potential for growth in the form. Sincerity to place, person and the moment are of upmost importance to how flamenco became an art form and how it will continue to grow. Q - What projects are you most proud of? Where do you see Clinard Dance going from here? I’m most connected to our original works like "From the Arctic to the Middle East" and "Chicago’s Watershed: A 156-Mile Choreography." The heart of these works are dedicated to people’s place and their sense of belonging and our artistic disciplines are used to serve that inquiry. The story that emerges aims to rally the human spirit. Where do I see Clinard Dance going from here is rooted in a long term dedication to art and flamenco; we’re in it for the long haul, large and small projects alike.